Drake Music Scotland has been creating opportunities for disabled musicians of all ages for twenty years. Emma Lines, Senior Programme Manager, tells us about their work, the ground-breaking Digital Orchestra and how Drake Music Scotland has been celebrating twenty years of achievements – with more activities to come in 2018, including an important campaign. Drake Music Scotland is a multi-award winning national charitable organisation. We create music education opportunities for disabled musicians of all ages to play, learn, compose and perform music. 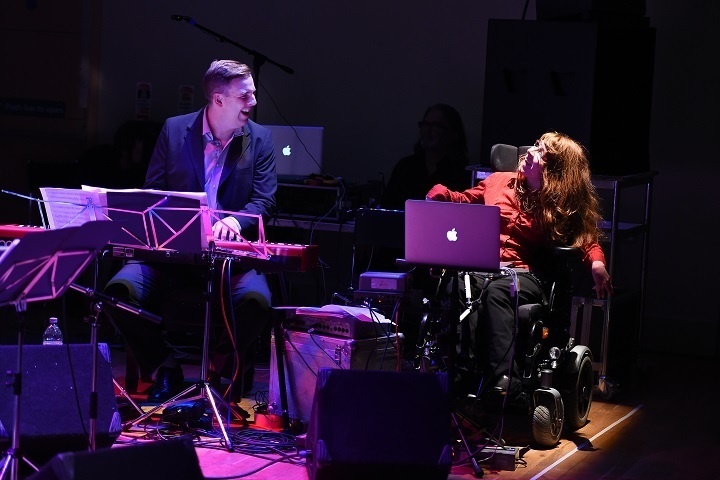 The organisation was established in July 1997 after Adele Drake set out her vision of using technology to support disabled musicians, and worked with Scottish musicians to set up activities in Scotland. Since we started out 20 years ago we have worked with over 10,000 children and adults throughout Scotland. Drake Music Scotland uses a variety of technologies and adapted instruments to enable all of our participants to play music, develop their skills and creativity, make progress with their music education and achieve their musical ambitions – whatever level they aspire to reach. We use Soundbeam to enable those with limited motor control to trigger and shape musical ideas; iPads are an amazing and flexible tool allowing us to work with hundreds of apps that can be specifically tailored to each user; Brainfingers uses bio feedback to control laptop based notation software Notion in live performance; Ableton Live and Push controllers are great for looping and creation of multi-layered tracks. 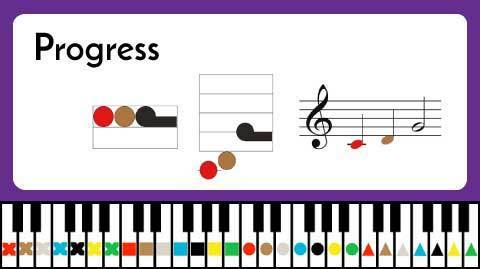 We also work with those with learning and communication difficulties and autism, making use of the colour and shape-based Figurenotes (figurenotes.org) notation developed in Finland, which helps anyone learn to read music. We created the Figurenotes software and are currently developing an app and other resources. Figurenotes notation is an alternative form of notation using colour and shape to show pitch and rhythm. It is very literal, so works particularly well with individuals with learning needs, autism and dyslexia. It was originally developed in the 1990s by Markku Kaikkonen and Kaarlo Uusitalo of the Resonaari Music School in Helsinki. Following a pilot project in 2010, Drake Music Scotland adopted Figurenotes and since then have produced resources, software and delivered training sessions to spread the use of this notation more widely. It has uses far beyond those with learning needs and is the easy way into music for anyone who struggles with reading standard notation. Each note is represented by a colour, and each octave by a shape. For example, middle C is a red circle, the C above is a red triangle and the C below a red square. This makes reading pitch very simple. Notes are shown by the length of their tail so the note is as long as it looks. Figurenotes notation progresses into standard notation through three stages. For our 20th Anniversary year, we launched an Artistic Programme of numerous creative collaborations in partnership with a range of organisations, including Scotland’s internationally renowned composer Sir James MacMillan, and his Cumnock Tryst Festival performing alongside Festival artists in residence, Scottish Ensemble and percussionist Colin Currie, National Youth Orchestras of Scotland, Aidan O’ Rourke, of acclaimed Scottish band Lau, as well as partners in Singapore and more locally across Scotland. Highlights to date include Kaleidoscope, written by Drake Music Scotland Associate Musician and Composer, Matilda Brown and Sir James MacMillan and performed in concert in September 2017 with pupils from Hillside and Barshare Schools, and residents of the Riverside Centre in Cumnock, East Ayrshire. A new commission Microscopic Dances by Oliver Searle for our ground-breaking, first in the world Digital Orchestra and the National Youth Orchestras of Scotland Jazz Collective premiered in August 2017. Both of these new works have been shortlisted for New Music Scotland Awards for New Music 2018, Kaleidoscope in the category of Royal Conservatoire of Scotland Award for Community/Education Project of the Year, and Microscopic Dances in the ISM Award for Collaboration category. Lost & Found, by disabled composer Sonia Allori, was performed at Eden Court Theatre in Inverness in September, a collaboration project with Strokeness (a support group for stroke survivors throughout the Inverness and Nairn region) and adults who have experienced neurological conditions. Our 20th Anniversary celebrations continue with our hosting a Symposium on 4 May 2018 at our home in Edinburgh to celebrate and discuss education development and career possibilities for disabled musicians, with presenters from across Scotland and England, along with international perspectives from Finland and Norway. Presentations will cover experiences of developing a musical career in composition, performing and teaching, with a focus on practical solutions. We want to talk about why this work matters, and the aspirational aspects associated with this work. Our 20th Anniversary concert, at the Queen’s Hall in Edinburgh on 5 May, will bring disabled musicians Centre Stage and will be the highlight of our anniversary year when Digital Orchestra will perform with Aidan O’ Rourke, of Scottish folk band Lau, together with other performances from our bands and ensembles including Junior Digital Orchestra, Liveheart, The Varifocals, and Audability alongside soloists using a range of technologies. Digital Orchestra is the world’s first youth orchestra using only digital instruments. 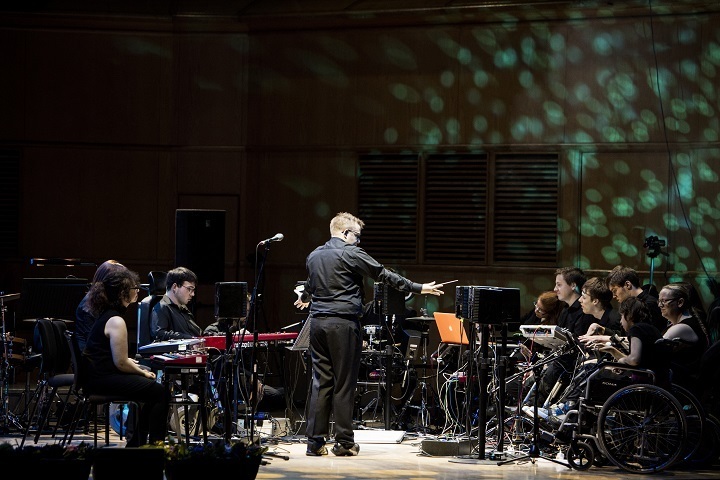 The orchestra first began in 2012 at our fifteenth anniversary performance with Technophonia, a collaboration, again with composer Oliver Searle, and musicians from Drake Music Scotland and school pupils from the City of Edinburgh Music School. Subsequently the group grew over the years and performed in numerous notable venues, until they exploded on to the scene in their current format in 2016 in collaboration with electric violinist Ian Peaston. The orchestra was then invited to the Glasgow Royal Concert Hall to welcome delegates to the International Society for Music Education in July 2016, performing to an audience of 1,500 alongside Phil Cunningham, Scottish Opera, National Youth Choir of Scotland and Royal Conservatoire of Scotland students. 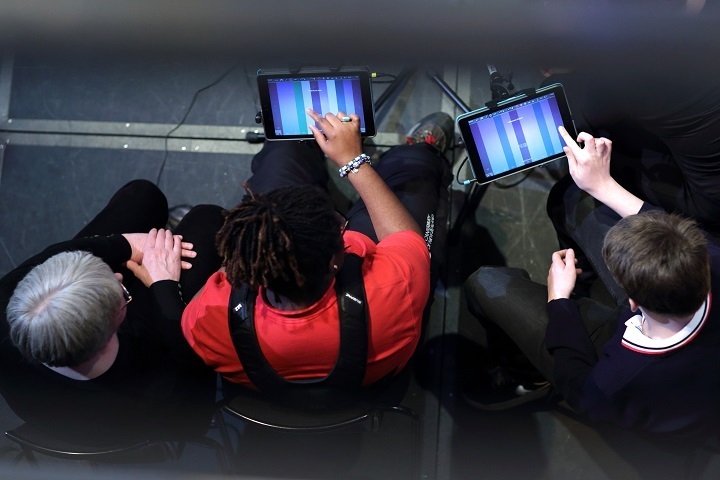 This event has opened many international doors for Digital Orchestra: after a performance at the Rehabilitation International Congress in Edinburgh in October, the group was invited to perform in Singapore at the Asia Pacific Festival of Disabled Artistes as part of the True Colours Festival in March 2018, the first of its kind in the Asia Pacific region. Digital Orchestra – the only guests from Europe – will join other performers from Australia, Singapore, Malaysia, Japan and New Zealand as special guests. Excited by these global travels, Digital Orchestra is looking forward to more international possibilities over the coming years, in Helsinki in 2020 and also Japan for the Paralympic Games in the same year. Despite these great innovations, there is still a lack of accessible venues in the UK for disabled performers. #LetMeONStage is Drake Music Scotland’s response: a campaign we are launching as part of our 20th Anniversary year. Neil Patterson, a Drake Music Scotland musician and a #LetMeONStage Ambassador, is the face of the campaign and is talking to organisations such as the Edinburgh Fringe Festival and Musicians’ Union about how to improve access to stages and green rooms, and about backstage facilities for performers. In response to our campaign, leading Edinburgh venue The Queen’s Hall (where we are holding our 20th Anniversary Concert) has bought a Mobilift for their hall with the help of donations from The Russell Trust, The Martin Connell Trust and Professor John Dale. Throughout the year we will also continue our existing programmes. All Join In works in around 50 special schools across Scotland. This programme is designed to engage creatively with teachers and schools, to offer training in the use of music technology and to create new music to be performed by pupils and shared with all participating schools. Our MusicSPACE programme offers individual and group tuition for bands at our fully equipped and accessible base in Edinburgh. Our Talent Development Partnership, supported by PRS for Music Foundation with Drake Music in England, develops opportunities for disabled composers and music creators. Drake Music Scotland would like to thank all of our funders for supporting this work, but in particular Creative Scotland (Regular Funding); Esmée Fairbairn for supporting Digital Orchestra; British Council, Singapore Airlines and individuals for the support of Digital Orchestra in Singapore; and The Royal Edinburgh Military Tattoo, City of Edinburgh Council, Castle Rock Edinvar, The Queen’s Hall for their support of our 20th Anniversary celebrations.